A long time ago, in a Midwestern state far, far away, I regularly taught classes in “World Regional Geography” to small auditoriums full of eager college students. There were several vague themes to these classes, such as “it’s good if you can find India on a map” and “a grown-up should really have a clue about how the weather works” and “people in other countries do things differently, yet not always as differently as you might think.” In addition, I always tried to outline a broad narrative for why it was that folks from a fairly limited number of places on the globe ended up imposing elements of their lifestyle across whole continents, while a vast number of other people have had to give up their ways of doing things, often at the point of a sword. I’ve never really missed that job – until now. Now, I want to go back and design a course that isn't structured around the appallingly fragmented textbooks I knowingly inflicted on the students back in the day. 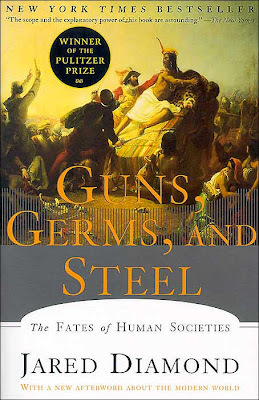 Instead, I want to design a class around texts like Jared Diamond’s Guns, Germs, and Steel. I have known about this book since it was published, but I had never felt the need to read a popular account of the same stuff that I spent nine years of my life studying. But that was a mistake, and not just because Diamond doesn’t only tell the story with much, much more style and grace than I ever did. More importantly for my purposes, his interdisciplinary approach brings to the table a lot of details that I hadn’t known about, and at several points clarified some of the leaps of logic that I hadn’t even really realized I was making. Our history as a species is kind of complicated, and of course there are a lot of zigs and zags in the pattern. What Diamond is able to do is zoom way back to a level where the big, prevailing pattern of history becomes clear. And that pattern goes like this: over time, dense agricultural societies tend to win. They win for a lot of reasons, perhaps not least that they end up with more people on their side than other kinds of societies. They are able, just like your fifth grade teacher told you, to support “specialists” who do things other than farm, such as make tools, write stuff down, or get everybody else organized whether they want to be organized or not. They are able to save up stocks of food for a bad year or for a marauding army. They are able to retain innovations, which have a way of dying out in smaller or more scattered societies. And crucially, they live in poor sanitary conditions in close proximity to animals, and thus periodically develop diseases that cut terrible swathes through their society. This certainly seems like a disadvantage when it’s happening, but if you know the story of how the West was won, you understand why enduring a little plague from time to time gives your society a grim advantage in the long run. So far, so good. But why do some societies become dense and agriculture while others don’t? Why did the good people of the Fertile Crescent and the Chinese plains develop dense agriculture early on while the good people of the highland Americas developed it late and the good people of Australia and so many other places developed it not at all? The answer, it turns out, is pretty much that people developed dense agriculture… wherever they could. See, where geographers and the like had gone wrong in thinking about this before is by focusing on climate. This had gone so very, very badly – to the tune of “people in temperate climates are quick-witted and vigorous, while people in tropical climates are stupid and lazy” – that there was a reaction against even thinking about the effect of environment on culture for several decades. 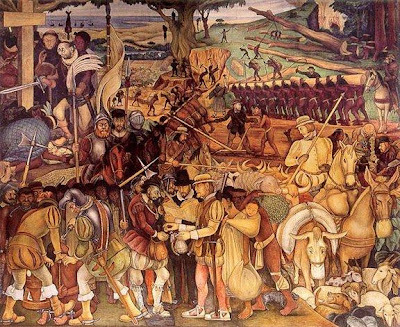 After all, even when you strip away any implicit racism, thinking about climate's influence on culture leaves holes big enough to march a marauding army through, such as -- to pick one of a thousand possible examples -- why did dense urban civilization develop in the Mediterranean climate of the Mediterranean, but not the Mediterranean climates of California, coastal Chile, or South Africa? There are, similarly, a lot of different kinds of animals in the world, and if you are like me you might assume that it is just a random few that happened to get domesticated. Diamond is able to make a pretty convincing argument – the jury isn’t entirely in on this one, but they are working on it – that no, the animals that got domesticated are the ones that could be domesticated. Bears, tigers, zebras, elephants, rhinos: sure, all might make superb eatin’, or great draft animals, or pass on terrifically deadly diseases for you – but it ain’t gonna happen. For various reasons dealing with hard-wired animal psychology, you simply can’t domesticate them. Happening to live near ancestral cows, sheep, goats and so on was thus a way of drawing a very high card in the game of societal competition. Ending up on a continent like Africa, where the abundant megafauna just happens to be resistant to domestication, or like Australia, where everything but a single kind of kangaroo was wiped out in the excitement of the first arrival of human beings several thousand years ago, is just plain bad luck. “Now wait,” you might be thinking. “This is raw determinism! Just because a society lives around ancestral wheat and ancestral goats doesn’t mean they will choose to make the big switch from hunting and gathering to sedentary farming.” And indeed not. In fact, you could make a case that the smarter societies would avoid such a thing at all costs, because hunting and gathering in a productive environment was a highly chill sort of lifestyle compared with the brutal drudgery of farming. But, says Diamond, this is irrelevant. Because eventually, over the many generations, some society will, for some reason – chronic scarcity, the rise of a bossy horticulturalist, or even a series of years where the gathering is so good in one specific meadow that it turns more or less by accident into a field – stumble over into agriculture. And once that happens, it incrementally confers so much power on that society and its new way of doing things that going back becomes very quickly impossible. A decade or two of growth at the rate made possible by farming's food yields, and you've got waaaay too many mouths to feed by hunting and gathering. There’s more work to be done on grand-scale history, to be sure. And Diamond even makes a fairly glaring misstep, with a chapter about the relative benefits of having your continent oriented along a longitudinal axis versus a latitudinal axis. What he’s getting at is how ecological barriers can inhibit the flow of ideas, technologies, and those handy epidemic diseases, but couching this as a matter of continental orientation, when you have a sample size of three, is a bit daft. But by and large, I suspect that future work on the large-scale history of humanity will be a progressive refinement of, rather than a serious alternative to, the narrative that Diamond outlines here. Some people, to be sure, will be bothered or appalled by such an amoral picture of history. We have raised to be in horror of the impositions of colonialism and imperialism, and in the better and fairer world that humanity has more or less been trying to build for the last little while, this is right and just. We recoil from the collective memory how the English wrested New Zealand from the Maori, and we recoil, though perhaps with some confusion, from Diamond’s telling of how the Maori wrested the Chatham Islands from their inhabitants, who they enslaved or slaughtered. 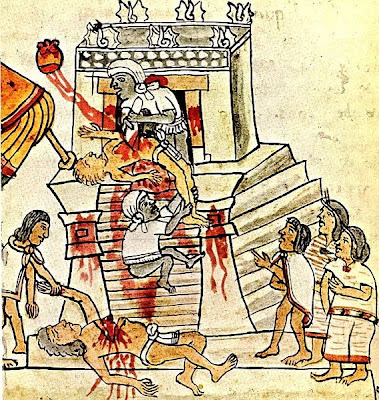 We recoil from the heinous story of Cortez and the Aztecs, as we should, and if we dig in a little we will also grieve for the many cultures trampled under the bare but powerful foot of the Aztecs. Human history is, alas, a story of bigger fish eating little fish, and in order to tell the story efficiently Diamond makes his sympathy for the little fish clear at the outset but does not repeat it in every paragraph. This lets him get beyond the well-meant but morally suspect story of history we teach our children – the story of how the big fish were wicked and the little fish were virtuous. Wickedness trumps virtue, we tell them, and that’s more or less how things came to be as they are. Instead, he is able to address with clear vision the question of why some fish got bigger than the others. And in so doing – abandoning my fishy metaphor – he actually makes history more rather than less humane. Diamond offers us a theory of history in which all peoples are created equal, none especially smarter, or wiser, or more virtuous than any other. Why, then, do some societies come to dominate others? Well, when you boil it down, it’s for the same reason that some people within any society come to dominate others. There is, to be sure, a little bit of what you might call individual or societal character involved. Mostly, though, the winners are the ones that happen to get started in the right place at the right time. I'm writing a brithday list as I read this, and this book is now going onto it. Thanks, Michael5000. Wait--so you didn't learn all this from playing Civ? I liked this book and also his next one, Collapse. We heard Diamond speak at Neighborhood State University. Most excellent. I think this is in my stack; maybe I should move it up. Owl: Best wishes for your brithday! Jennifer: Civ really is of course a tremendous entertainment product, and considering when the basic code was made presents a remarkably defensible model of big history. It makes me a little wistful to think of the games we don't have now, and probably never will, because the money is all to be made in games with fast-moving shiny colors. la gringa: Yeah, Collapse is good too. Although the whole Norse experience in Greenland is probably the saddest story ever told. I wouldn't want to read it back to back with "Mill on the Floss." Elaine: Influence! You flatter me! Loved, loved, loved that book! I actually tried to read a few non-fiction books right after I got done with it before I remembered that I hate non-fiction. donk: Right? It's like non-fiction for those of us who can't read non-fiction! A-HEM!!!! WEdnesday QUIZ answers still MISSING!!!! Quiz answers and late-season leaderboard have been provided. Best of luck with that tornado! I woke up an hour early this morning because my brain was rejecting the premise about the animals that can be domesticated. It puts the cart before the horse. It's true that the zebra is a nasty, mean, vicious animal of which few individuals have been sufficiently broken to go under saddle or in harness and it's true that you can sit a child on a Shetland pony. But the modern horse is the result of thousands of generations of breeding for not just speed, strength and size, but ease of handling. There are still horses that are just plain mean and dangerous. A Shetland pony is also a vicious little thing. A newborn horse foal thinks nothing of kicking you in the kidneys as soon as it can stand. A horse and a zebra are so genetically similar that they can interbreed and the resulting offspring is occasionally even fertile. Ancient breaking techniques would have been far crueller than modern ones, with the 'domesticated' animals probably hobbled, even hamstrung, starved and deprived of water to weaken them. Even in the last hundred years our handling of domestic horses has become more humane. There is no reason why the reindeer works in harness and has been domesticated for 7000 years, while the caribou is "untamable." They are the same species: Rangifer tarandus. I see your cow and call bison (I ate a steak from a domesticated one just last week), xebu, llama, and yak. I see the pathetic little grains on wheat and call African yam, of which 50,000 years of cultivation hasn't done Nigeria a lot of good. I'm willing to offer alternate theories to the one I call BS on. I suggest that people move to domestication after they have hunted the easy big meat to near extinction. Why keep the cow when the meat is free? Two hours later and it's still bugging me. To say that certain variants of a type are intrinsically, genetically and irreconcilably superior for the development of civilization is the same argument that the author is trying to refute. The only difference is that in the 19th century the experts applied the argument to the humans rather than to their produce. Avia: Zowie, my review made somebody stew for three hours! That's awesome -- by which I mean, highly flattering to me! Diamond dedicates several pages specifically to the zebra, the details of which I don't recall. As for the reindeer/caribou -- sure, it's one of the relative handful of domesticated species; it granted its tamers a certain local hegemony, but has a pretty limited range to fuel empire-building. Yak, similarly. Xebu's basically a version of cow. You might bring up water buffalo as another important domesticate; its domestication, too, led to big advantages for the domesticators. Llama is also an important item on the domesticate list, but is not quite the prize as the above. It's a terrific fiber source, but small for an eatin' animal; it's famously a pack animal, but just not big or strong enough to PULL anything meaningfully, such as a war chariot, wagon full of swag, or -- hugely -- a plow. African yam may not have done the modern country of Nigeria a ton of good -- although actually, it does -- but it looks to have fueled one of the major societal expansions of world history, the conquest of sub-Saharan Africa by Bantu peoples. I don't remember what the deal is with Bison. As for your second comment: The 19th-mid 20th Century argument postulated differences WITHIN a single species, either intrinsic or due to environmental influence. This is inherently illogical: not only is a species is a species, but you can tell just by having conversations with a random range of humans that we've all got the same mental equipment. Diamond's ecological argument focuses on the differences AMONG species available to the local humans, which is an entirely logical way to proceed. What I think you're catching on is the notion that some species are significantly, inherently more powerful when they fall until human hands. But think of it this way: there is obviously a RANGE of utility, with oats being damn fine, strawberries being handy but less so, lilac being ornamental but not good for much [ethnobotanists: humaliate me here], and, I don't know, weeds is weeds. Being a scientifically minded person and confronted with a huge sample, it might seem reasonable to you to assume a bell curve of relative utility. Then, a bell curve assumes a few extreme outliers -- in a random sample (for, unless you are making an intelligent design argument, there's no reason that human utility among plant and animal species would be anything but random) we are bound to see a few individual items that are exceptionally high or low. On that bell curve, for reasons of grain size, protein content, harvestability characteristics, reproductive characteristics, and so on -- wheat is way out there on the far tail. Wow ... what an amazing book review of what sounds to be an amazing book. It sounds too big for My Very Little Brain to read but I get the bottom line that you so thoughtfully provided. 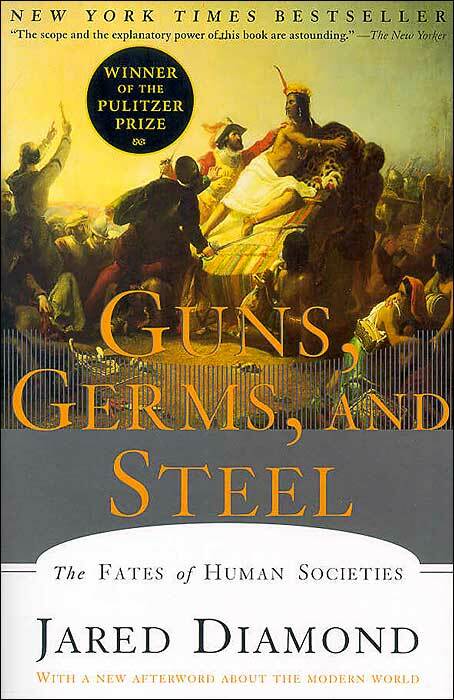 I have gotten to teach with this book (as well as with "Collapse", in different semesters) to a bunch of honors students, and indeed, it is a lot more interesting than your typical textbook fare. I'd really like to teach it to a bunch of seniors instead of a bunch of freshmen. I like the fact that he has the nerve to take on such a huge topic, and to do so relatively successfully. I think the story in "Collapse" about (one of those Pacific islands whose name escapes me) whose trade network broke down after some other island ran out of trees big enough to make canoes, and pretty much slowly starved to death to be the most chilling part of the book. There's all kinds of fodder for discussion too. I did have one of my students at the end of discussion over "GGS" come up to me and say "well, this is all well and good if you believe in evolution, but since evolution didn't happen, he's just making all this stuff up." I'm glad you liked this book. It was really a mind-blower for me when I read it. 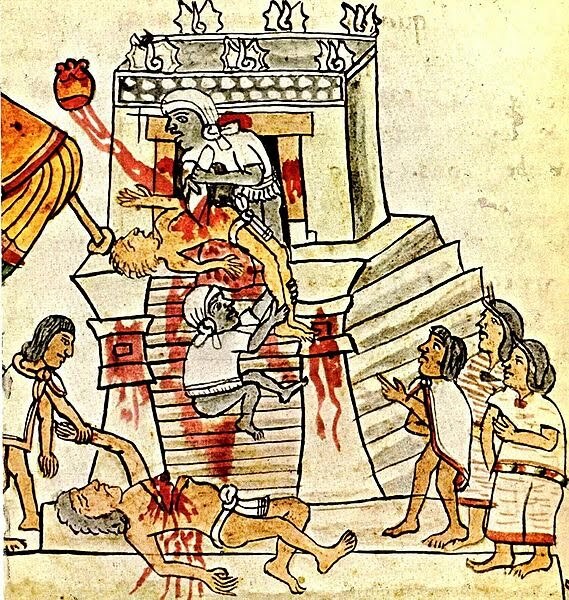 I'd occasionally wondered why certain societies ended up able to conquer others, and why the odds always seemed so totally stacked in favor of Europeans for example. This book posits a really strong theory and provides lots of interesting evidence / examples. I really like having his broad over view of How The World Works when looking at individual stories in history. Papers by the likes of Hawks, Ben Voight & Scott Williamson, also show agriculture & population expansion lead to increased genetic change. More recent books like ‘The 10,000 Year Explosion: How Civilization Accelerated Human Evolution’ by Harpending & Cocrhan, or ‘Before the Dawn’ by New York Times science writer Nick Wade build on Diamond’s work in this respect.